Members of the benthic team of the PIFSC Coral Reef Ecosystem Division (CRED) returned to Honolulu on May 8 from a week-long deployment on Kaua`i, where they conducted surveys as part of a project funded by PISFC and NOAA’s Coral Reef Conservation Program (CRCP) to better understand the prevalence and spatial distribution of an outbreak of bacterial coral disease that was reported in 2012 for areas off the north shore of Kaua`i. A 4-member team of CRED scientists—Hatsue Bailey, Matt Dunlap, Brett Schumacher, and Bernardo Vargas-Ángel—conducted surveys on April 30–May 7 at 36 sites in Hanalei Bay, Wainiha Bay, and `Anini Reef to acquire detailed data on demographics and health conditions of coral communities in these areas. 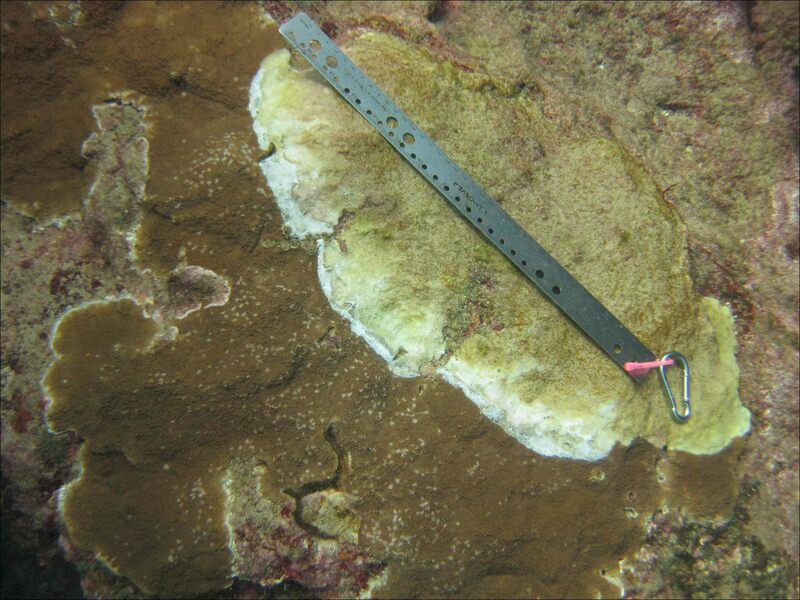 This survey effort expanded and complemented the investigations already undertaken by Thierry Work, PhD, of the U.S. Geological Survey (USGS), and Greta Aeby, PhD, of the Hawai`i Institute of Marine Biology (HIMB), University of Hawai`i at Mānoa. The team completed belt-transect surveys at predetermined reef locales and sites, which were selected in consultation with scientists from partner agencies, the USGS and HIMB, as well as with other local experts. The data from these surveys will be used to provide the basis for quantitative estimates of disease prevalence. 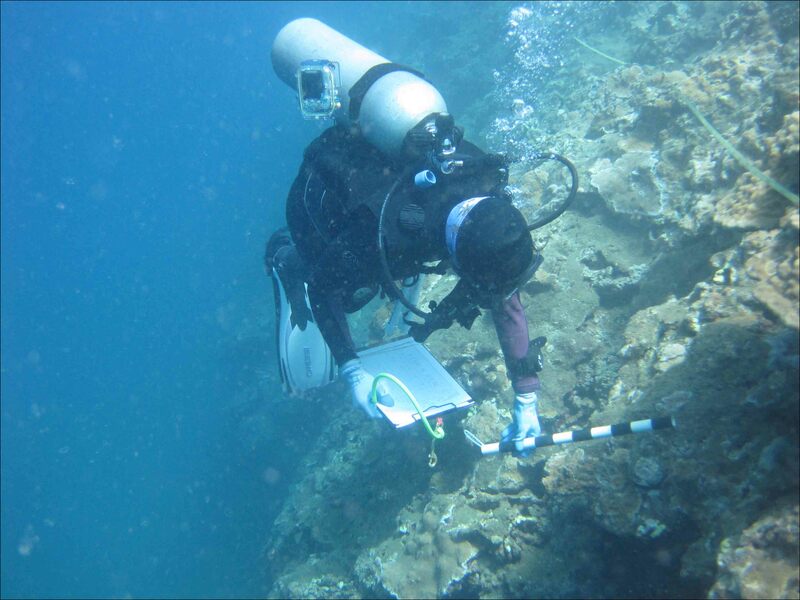 These surveys and their data are congruent with current, historical, and future coral reef monitoring activities conducted and data collected by CRED in the main Hawaiian Islands and Pacific-wide under the auspices of the CRCP’s National Coral Reef Monitoring Program. Preliminary findings from these surveys corroborate the occurrence of disease “hotspots” within each of the reef systems surveyed and confirm the unique nature of this event. We’d like to extend special thanks to Thierry Work, Greta Aeby, and Eyes of the Reef volunteer Terry Lilley for sharing their knowledge regarding this outbreak and making our mission a complete success. We look forward to fostering these and other collaborations as we continue to work together for the betterment of reefs in Hawai`i and the larger Pacific Islands region. This entry was posted in coral reef ecosystem and tagged belt-transect survey, Bernardo Vargas-Ángel, Brett Schumacher, coral communities, coral demographics, coral disease, coral health, Coral Reef Conservation Program, Coral Reef Ecosystem Division, corals, CRCP, CRED, Eyes of the Reef, Greta Aeby, Hanalei Bay, Hatsue Bailey, Hawai`i Institute of Marine Biology, health condition, HIMB, hotspot, Kaua`i, main Hawaiian islands, Matt Dunlap, Montipora patula, National Coral Reef Monitoring Program, NCRMP, outbreak, Pacific Islands, rice coral, Terry Lilley, Thierry Work, tissue loss, U.S. Geological Survey, University of Hawai`i at Mānoa, USGS, Wainiha Bay, `Anini Reef. Bookmark the permalink.